There are many posts in this blog which essentially explain water level controller circuits, with the specific intentions of switching the involved motor pump when the tank fills up. However there are folks who just require an indication of the different levels of water in the tank rather than have an automatic shut off facility. The switching OFF of the motor is preferred to be carried out manually, which is considered more reliable and safe by them. The proposed water level circuit idea is specifically suited for the above type of readers who are satisfied with the indications only and want to do the shutting part of the motor manually as per the readings of the indicator and as per the desired water levels in the tank. The circuit presented here is again super simple to build, involving only a single IC 4049 for the intended applications. 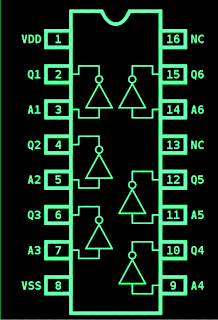 The IC as we all know have six NOT gates, these gates are simple inverters, meaning they will invert any voltage level at their input pins to exactly the opposite level at their output pin. So if a positive is applied to the input, the output would instantly produce a negative and vice versa. The high input impedance of CMOS gates makes sure that potential even with very low currents are suitably sensed and interpreted by them. The idea is simple, the ground or the negative voltage (point 0 in the figure) is held at the bottom most part of the tank, such that the water reaches this point first up when it starts filling. As the water level goes higher, it subsequently comes in contact with the inputs of the NOT gates arranged serially upwards. 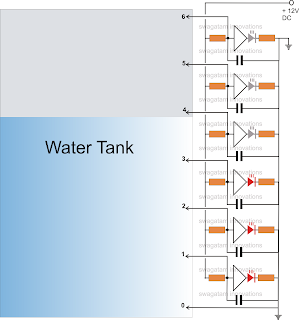 The negative voltage stationed at the bottom of the tank leaks through the water and comes in contact with the relevant inputs of the gates. This negative potential applied at the subsequent inputs of the gates means a production of an opposite voltage, that is a positive potential at their outputs, thats what exactly happens. The positive voltage thus generated lights up the concerned LEDs, indicating which input of the gate at what level has come in contact with the rising water level. The sensor wire terminals from the circuit in the form of the points 0 to 6 may be arranged over a non conducting stick made up of plastic with brass screw heads fitted as the sensor termination. All capacitors are 0.1 disc ceramic. All LEDs are red 5mm, or as preferred by the maker.